Have you ever visited with Joy the Baker? If not, you're in for a treat! She has many delicious recipes!! 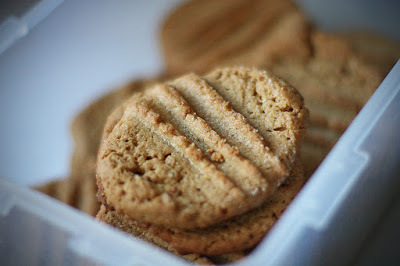 This one, Flourless Peanut Butter Cookies, is to die for. Easy. Quick. LOTS of peanut butter flavor. Everyone in the family LOVES them. You NEED to make some tonight!!! Preheat oven to 350 degrees F. Grease a baking sheet with butter and set aside. In a mixer combine peanut butter and sugars until well combined, about 2 minutes. Add egg and baking soda and mix for another 2 minutes. Roll into walnut sized balls and create a cris-cross pattern with a fork. If you'd like, add a few chocolate pieces to the top of the cookies. Bake for 10 minutes, until lightly browned. Cool on a baking sheet for two minutes, then transfer to... your mouth. Those do look good! I think I shall make them this afternoon as a surprise for my boys. My mom is diabetic so I make these for her! I just substitute the sugar with 1 1/4 cups of splenda. I just made these yesterday and will be posting about it later. They were amazing! I'm so glad that you liked them!! I can't wait to read your post about them later today!! EXCELLENT idea to use splenda in place of sugar!!! Thank you for sharing that!!! My children made these today and they were wonderful! Thanks a bunch for the recipe. BTW...I'm enjoying your blog.